As the Flames walked off the field following a loss to Charleston Southern in the last home game of the season two weeks ago, making the Football Championship Subdivision playoffs seemed to be an improbable dream more than a legitimate possibility. With Liberty’s postseason hopes on the line in the final seconds of the ensuing game, Coastal Carolina kicker Alex Catron lined up for a 24-yard field goal and the No. 1 Chanticleers had all but sealed a Big South Championship. But the Flames had other plans. As time expired, Liberty defensive end Chima Uzowihe got a hand on the ball, blocking the kick and sending the Flames to the playoffs for the first time in school history. The Flames continued to make history when they traveled to Harrisonburg, Virginia, and beat the James Madison University Dukes Saturday, Nov. 29, with a score of 26-21. 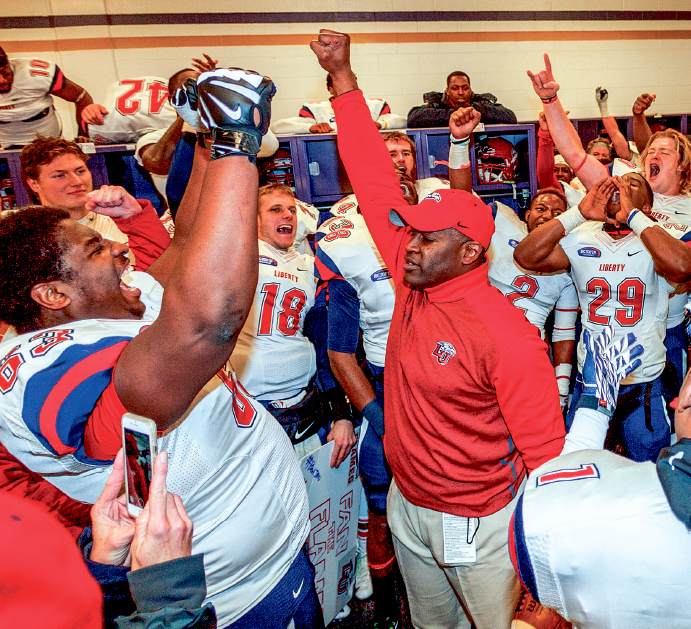 In addition to winning its first playoff game in program history, Liberty snapped a six-game losing streak against the Dukes and put a stop to the Dukes’ seven-game winning streak. Gill said he was pleased the team persevered in order to reach the playoffs. Falwell praised Gill, saying he has played a vital role in the development of the football program over the past few years. As they continue their playoff run, the Flames will travel to Villanova, Pennsylvania, to take on the No. 6 seed Villanova University Wildcats Saturday, Dec. 6 at 4:30 p.m. Tickets are $20 each and can be purchased online by searching “tickets” on Liberty’s website or by calling 434-582-7328. The game will also be broadcast on ESPN3, ESPN’s online live streaming service.